If you read my blog regularly, you may recall that last April, I had my first Mum’s Night off in almost 7 years. Myself and my best blogging buddy headed to Last Drop Village in Bolton for 24 hours of heaven. (You can read more about it here). Nine months has now passed since my last night off parenting duties. So myself and ClearlyBex have treated ourselves to a bargain spa break at Last Drop Village. We go tomorrow and I cannot wait! 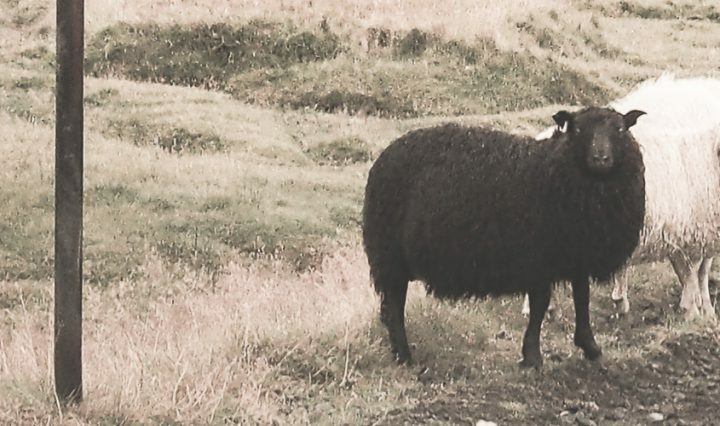 What’s Included With Our Bargain Spa Break At Last Drop Village? 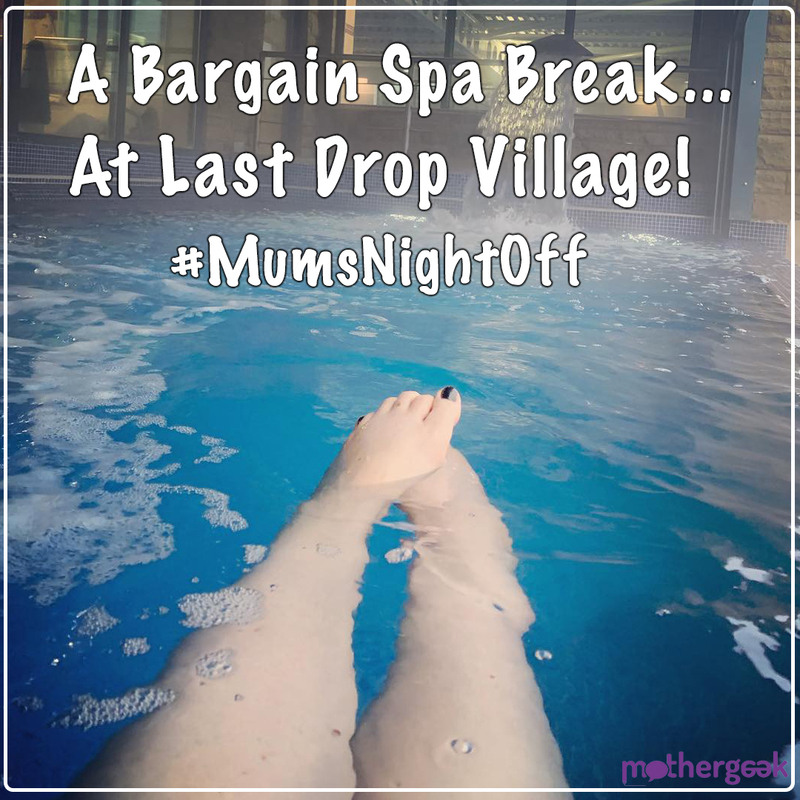 Our bargain spa break at Last Drop Village is for 2 people. The price we paid includes a twin or double room. It also includes a 2 course evening meal and a glass of Prosecco each. Not to mention breakfast, full use of the spa, and one treatment each as well! We have both opted for the aromatherapy warm stones back massage. I cannot wait! How Much Did Our Spa Break At Last Drop Village Cost? We got an amazing deal from Wowcher… We paid just £149 for the entire package – That’s £74 each! The massage alone costs over £30, so we are paying just £40 each for everything else! Bargain! What Does The Spa Offer? Hydro pools are believed to offer extensive health benefits. They expose the body to hot then cold air. It’s thought that alternating between hot and cold air treatments can help to enhance various bodily functions, heal injuries, and reduce inflammation. All I know is that the outdoor section is amazing, and it leaves me feeling both relaxed and content. (Photo below). This humid environment is ideal for those with respiratory problems. It’s great for clearing noses and chests, and leaves your lungs feeling more open, in my experience. The added eucalyptus essence rejuvenates both your body and mind. The rock sauna provides a traditional Finnish sauna experience. The health benefits can include: reducing blood pressure, enhancing immune system, improved circulation, andjoint and muscle pain relief. This offers similar health benefits to the rock sauna, but it doesn’t get as hot. Aromatherapy can have a profound effect on your mind and behaviour. 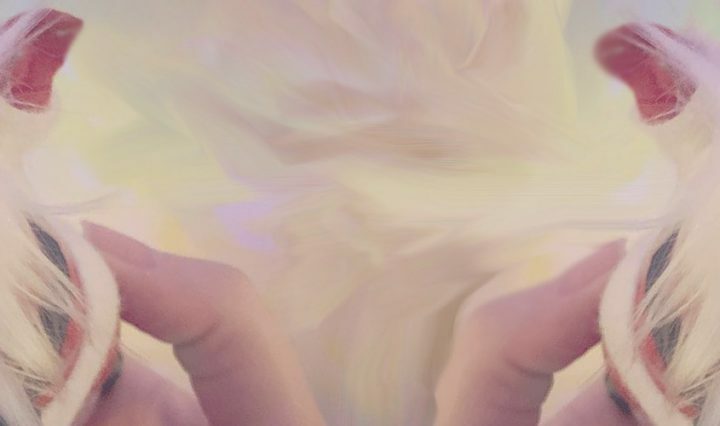 It soothes away the stresses of modern life, and is incredibly relaxing. At 18 meters long, and 1.2m deep, the pool is more than enough to swim some proper lengths. 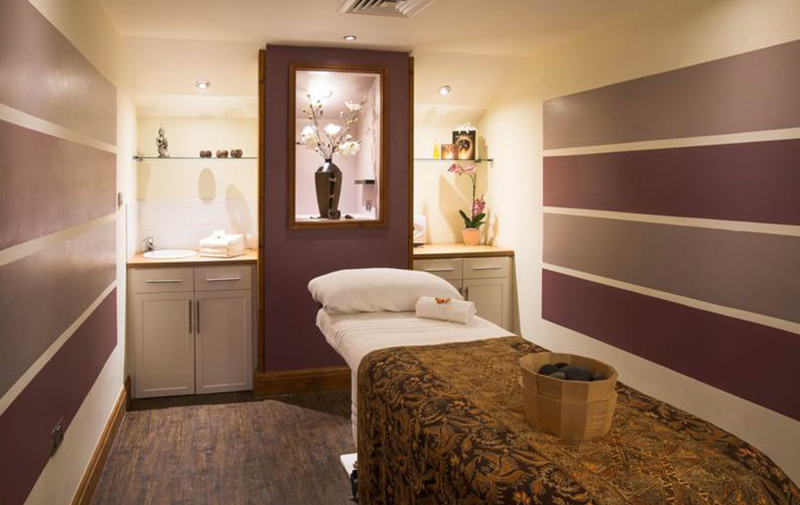 Breathing in the dry salt aerosol in the halo therapy room is believed to foster good sleep. It can alleviate symptoms of allergies and asthma, not to mention relieve hypertension and stress. After you’ve unwound in the spa, you can head down to the hotel’s Courtyard restaurant, for a delicious two-course dinner. Your comfortable room boasts a large, comfy bed, complimentary Wi-Fi, Freeview TV, and tea and coffee making facilities. When you wake in the morning, you can enjoy a delicious full English breakfast, or opt for a lighter bite from the buffet. It’s no wonder we’re going back! 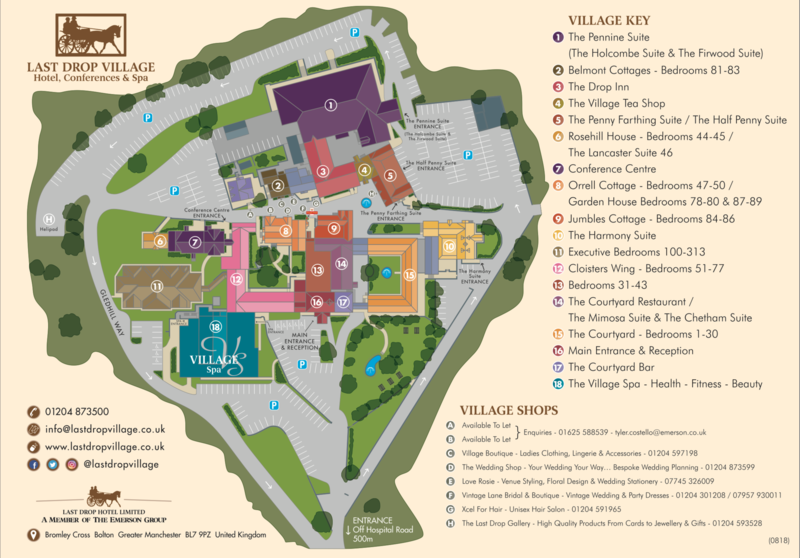 There’s much more to see and do in and around the village though – see the below map for an idea of the layout and the on site shops. Finally, if you want to grab this bargain break for yourself, you need to book it via wowcher. OR call the hotel directly on 01204 873519 and quote MotherGeek to get the same deal I did AND the free room upgrade if there’s availability. (This way you’ll be sure they have availability on the dates you want, and you won’t have to pay until 2 days before your stay! You can check in and use the facilities from 2pm on your arrival day. Checkout is 11am, but you can use the facilities after checkout. You’ll need £1 for the lockers in the spa. (This is refunded though). When you get down to the spa, they will lend you towels, to save you bringing your room ones down. There’s a free water fountain in the main spa area. Plus free tea, coffee, water and juice in the relaxation area. The area around the hydrotherapy pool is humid, so I’d advise against taking your phone in with you – unless it’s waterproof! PHEW! I think that’s about all of the information you need! EDIT: March 2019… We absolutely loved our break – read about it in full here! Sounds really good and can get a sense of your excitement!